•	Cero clearance during alternate turning. •	High sensitive and high torque. • Lubricant free, no noise & without torque transmission loss. 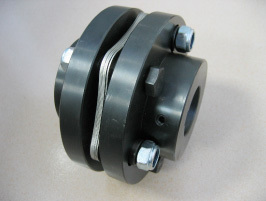 • Suitable for axial sizes: 8~60mm. •	Stainless steel diaphragm plates for compensating angular misalignment, parallel offset and axial displacement. •	High precision and reliable & long working life. •	Very suitable for servo motors and stepping motors. •	Material: Hub made of C45 steel with black oxided finishing, Diaphragm plates made of stainless steel.